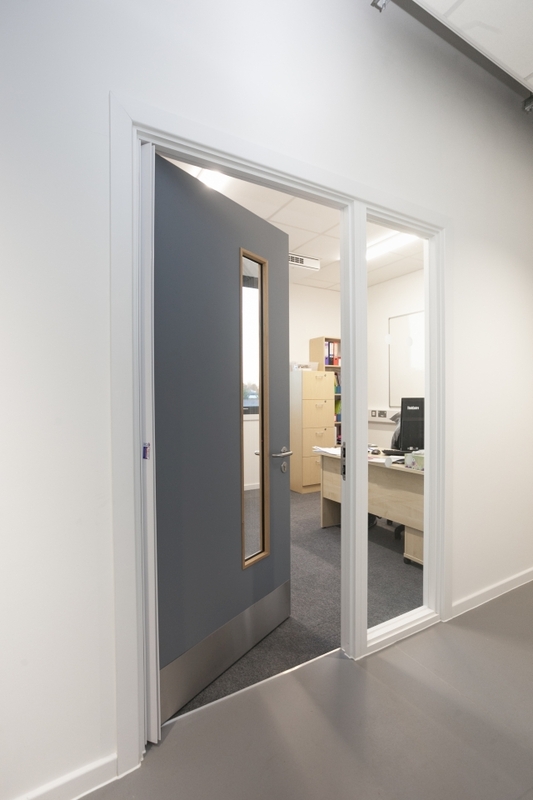 Severe duty acoustic doorset featuring a door leaf and frame that have been tested to achieve an acoustic sound reduction of up to 45 dB Rw. Independent third party tested to achieve sound reduction from 29–45 dB Rw. Special high density solid core door leaf with 10 mm hardwood lipping on all four sides. Fully factory prepared for mortice ironmongery, including lock cases and flush bolts. Door leaf face prepared for lever handles and cylinders. Single, leaf and a half and double configurations are available – single swing only. A wide variety of sizes and shapes of vision panel either with flush or bolection beads are available. Matching timber-framed glazed screens available. Mechanical durability tested to BS EN 1192, Class 4 severe duty. Mechanical strength tested to BS EN 12400, Class 8 (one million cycles). Acoustic rating up to 45 dB Rw sound reduction. Education – teaching spaces and music rooms. Equal pair, single action with transom and overpanel or fanlight. Single leaf, single action with transom and overpanel or fanlight. Unequal pair, single action with transom and overpanel or fanlight. For 29–30 dB Rw only, not available with FD60. For 35–45 dB Rw and FD60 only. Safehinge lining with separate stop, single action. Sports hall rebated lining with integral stop. Vistamatic privacy, 400 x 400 mm. Vistamatic privacy, 250 x 800 mm.